Also serving communities of Pemberville. The average cost of assisted living in Bowling Green is $3,900 per month. This is higher than the national median of $3,346. Cheaper nearby regions include Maumee with an average starting cost of $3,750. To help you with your search, browse the 9 reviews below for assisted living facilities in Bowling Green. On average, consumers rate assisted living in Bowling Green 4.7 out of 5 stars. Better rated regions include Waterville with an average rating of 5.0 out of 5 stars. Caring.com has helped thousands of families find high-quality senior care. To speak with one of our Family Advisors about assisted living options and costs in Bowling Green, call (855) 863-8283. Bowling Green is a town in northwest Ohio, that's part of the Toledo Metropolitan Area and home to Bowling Green State University. Bowling Green's population of just over 31,000 people includes 4.9 percent over the age of 65. There are two Assisted living facilities in Bowling Green and seven more in the cities of Perrysburg, Maumee, Waterville and Pemberville. In Bowling Green, as in all of Ohio, assisted living facilities are designated as residential care facilities (RCF) and are regulated by the Ohio Department of Health (ODH). The ODH is responsible for licensing and facility inspections, including one unannounced inspection each year. Bowling Green experiences typical weather for Midwestern cities with a summer high average of 84 degrees and a drop in winter months to an average of 18. The city experiences and an average of 73 days with precipitation, either rain or snow which could complicate health and mobility issues for seniors. The high humidity levels in the summer could also complicate respiratory issues for the elderly and those predisposed to breathing issues. The cost of living in Bowling Green is 17.8 percent lower than the average, notably in the areas of housing, groceries and utilities. Tax rates for Bowling Green are slightly higher than the national average. The Sales Tax Rate is 6.8 percent compared to the 6 percent national average and the Income Tax Rate is 5.4 percent compared to the 4.6 percent average U.S. rate. Public transportation in Bowling Green is available through B.G. Transit, a demand response system which provides rides in the city as well as a one-mile radius outside the limits. Seniors are eligible for discounted rates. In nearby Toledo, the Toledo Area Regional Transit Authority (TARTA) offers rides in the area with 100 percent wheelchair accessible vehicles and a TARPS Paratransit service for riders with special needs. The Bowling Green Arts Council encourages artistic talent in residents of all ages and hosts several events each year including an Artwalk and Art in the Park. The Bowling Green area is home to the Wood County Hospital in the event of medical emergencies or illness. Assisted Living costs in Bowling Green start around $3,900 per month on average, while the nationwide average cost of assisted living is $4,000 per month, according to the latest figures from Genworth’s Cost of Care Survey. It’s important to note that assisted living rates in Bowling Green and the surrounding suburbs can vary widely based on factors such as location, the level of care needed, apartment size and the types of amenities offered at each community. 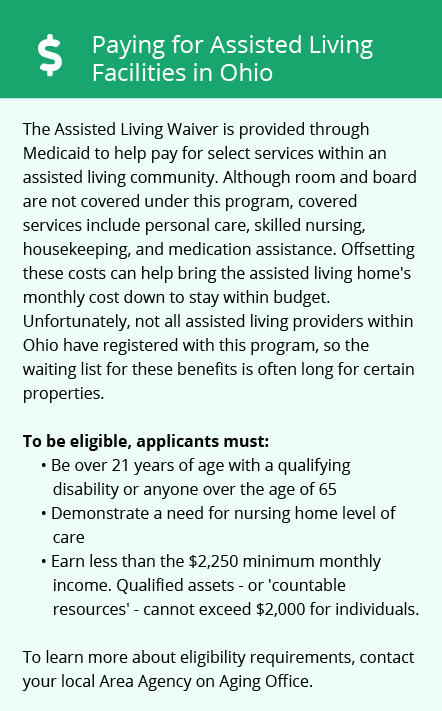 The Residential State Supplement Program (RSS) is available through the state of Ohio to provide support to eligible applicants for financial assistance paying for assisted living expenses. 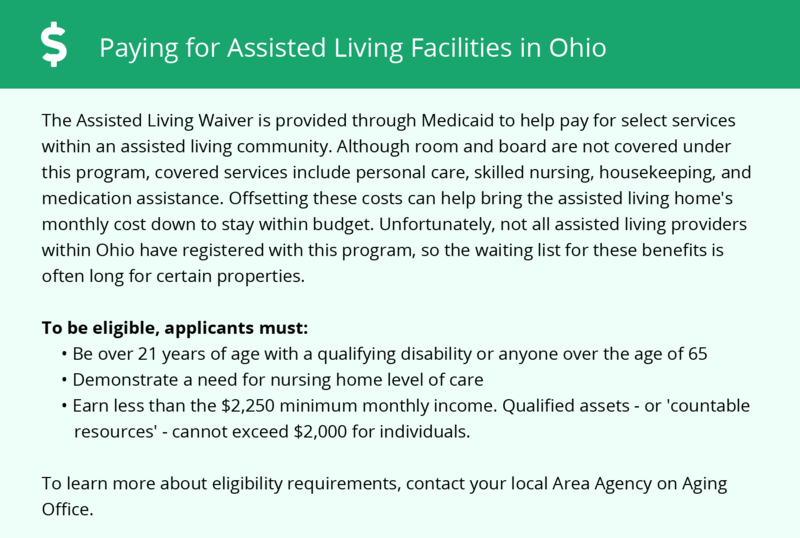 Maumee residents may also be interested in the Assisted Living Waiver benefits available through Medicaid. Bowling Green and the surrounding area are home to numerous government agencies and non-profit organizations offering help for seniors searching for or currently residing in an assisted living community. These organizations can also provide assistance in a number of other eldercare services such as geriatric care management, elder law advice, estate planning, finding home care and health and wellness programs. To see a list of free assisted living resources in Bowling Green, please visit our Assisted Living in Ohio page. Bowling Green-area assisted living communities must adhere to the comprehensive set of state laws and regulations that all assisted living communities in Ohio are required to follow. Visit our Assisted Living in Ohio page for more information about these laws.